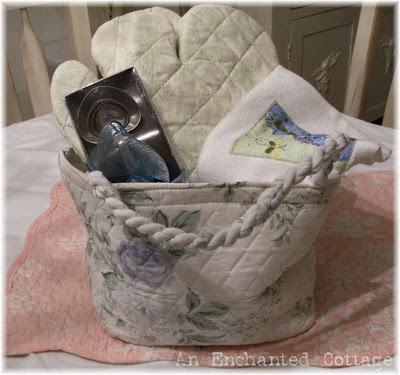 ... all tucked into this little quilted tote. 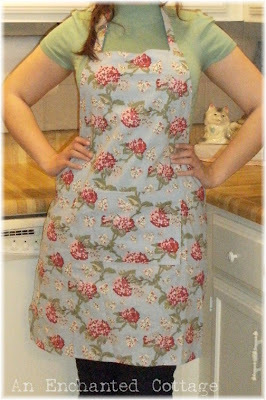 Here you can see the style of all 3 aprons (my Amanda is modeling the light blue floral one). Or the dark blue floral apron. To enter, just leave a comment on this post and I'll draw the winner on May 30th... Good luck to everyone who enters!!!! Now, be sure to click the logo below to go to Kim's lovely blog where you'll find a list of everyone participating in this year's Cottage Charm Giveaway (and if it's anything like last year's giveaway, you'll be blown away by all the incredible goodies being offered!!!) And while you're there, be sure to check out all the incredibily realistic sweets and treats that Kim creates! Good luck, everyone!!! And thank you again, Kim! Good Morning....I would love to be included in your very pretty give away!! Have a great day. Hi Donna, great giveaway. Love the aprons and the measuring cups. The whole idea is great. Enter me in the giveaway and I'll be back to see how things are going. Have a great day!! 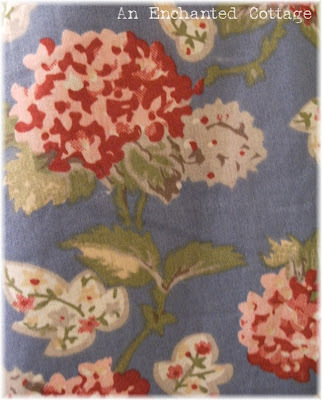 What a nice cottage giveaway...the light blue apron would like nice hanging in my kitchen! Fabulous giveaway.... I'll have either of the blue aprons pretty please with sugar on it. What fun! I would love to be entered. What an awesome giveaway. I just love the green toile. thanks for the great giveaway. btw, love your fur babies, too. What a generous and gorgeous giveaway! I love the green toile, so my home! I love the aprons. Please enter me to win your wonderful prize. What a wonderful giveaway - how generous! Thanks for join this year :) Since you are a Cottage Charm Giveaway hostess, feel free to enter the drawing for the hostess gift here! oh my, what a generous giveaway, just beautiful. This is surely a sweet giveaway. Those aprons of yours are very well done. Love your colors!! Very pretty, thanks for the chance!! Good morning--- What a wonderful giveaway- ALL of the aprons are just adorable! Love to me entered in this terrific giveaway! What a wonderful givaway. Thankyou! Great give away prize for sure! What a sweet giveaway. Love it. Count me in! Love your aprons! Your blog is lovely! I would love to have the green toile apron! Heavenly! Wow...love it all!!! Please include me and thanks you so much! I love the green toile! Please add me to the hat! What a pretty giveaway! I really like the aprons. Have a wonderful Monday. All of her stuff is so cute....I love the green toile. Can you include me in your giveaway? Oh the cupcakes I could make with those measuring spoons! Would love to be included in the giveaway!! I love all the items you included!! As far as picking on of the aprons...way to hard for me, they are all beautiful!! Thanks so much for allowing me to be included!!!! I love your blog!!! Oh my, how fun! Everyone loves to receive goodies! 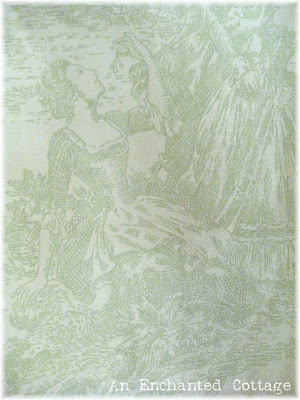 Oh, I love the green toile! You are very generous! What beautiful aprons!! I'd really really need the rose patterned one, I think! Thanks for offering these prizes. Hi Donna, I love all the giveaway stuff, please enter me in the drawing. I love the light blue apron and I'll keep my fingers crossed. Thanks. I love everything! 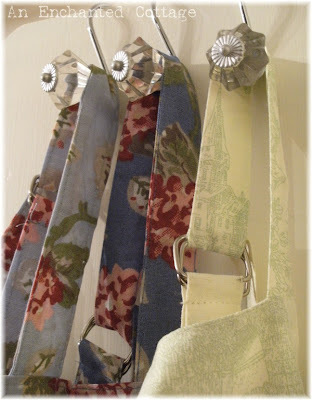 The aprons are gorgeous..I think one can never have too many aprons! Thanks! Hi, what a fab-u-lous giveaway! I would be honored to cook for my family wearing your beautiful green toile apron. I LOVE aprons and giveaways, thanks! Lovely giveaway-I like the dark blue color for the apron. Oh my! What a nice giveaway! 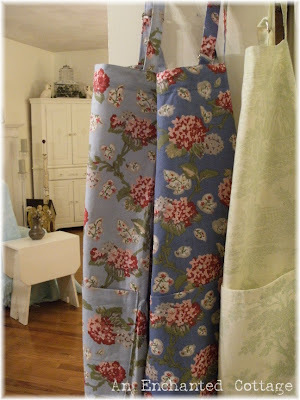 I would love to win that toile apron! So cute! 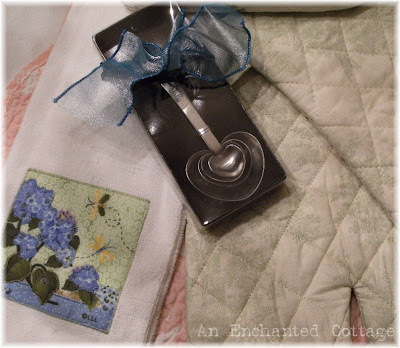 I would love to be entered in your giveaway - I love the toile apron and those little heart-shaped measures - so cute! Your giveaway package is adorable! Thank you for being so generous! Your giveaway is wonderful! Love it all.... I hope I win! What a sweet give away...Count me in too! Thanks!! What a sweet give away...Count me in too!! Thanks!! What a sweet give away....Count me in too!! Thanks for the chance!! What a sweet give away...Count me in too please!! Thanks for the chance!! Thank you for your generosity - both for the gifts and for including those of us who live outside of the USA - please add me to your giveaway! Visiting your blog is almost as much fun as visiting the Christmas Tree shop! As always lots of fun things going on in your blog space. Love the green toile apron! What beautiful aprons! Good luck to all who enter! Please include me in your drawing...Such pretties!...Have a great day! How wonderful! I love everything you make! WOW! Thank you! Wow!!! Love these prizes. Hope I can win. please include me! I love that light blue, thought they are allpretty! So pretty! Please enter me. I would love the green toile apron and the other goodies. Thanks for the giveaway. You are so generous. Love the light blue apron. What a cute giveaway. Love the dark blue floral apron. Please enter me. Thank you. Ooohh...I love these items!! I'd love to win them. :) I'm looking forward to spending more time checking out your blog! Great tote full of goodies for the kitchen! Please enter me in the giveaway. What a wonderful giveaway. The aprons are fantastic! Such cute aprons! Thanks for hosting a giveaway! I love your giveaway. Please enter me. I have really enjoyed your blog. Have a wonderful day. I am speechless!What a pretty give away! Please include me and consider me a new follower! Oh my goodness! What a great batch of confections! The green toile apron is just the sweetest thing! Your giveaway goodies are so pretty! Thank yo so much. So lovely! I would love the light blue apron! I'd love to be entered. What gorgeous things! This lady from California would love to be entered! Count me in! Oh my, those aprons definitely look lovely! I would love to win, thank you! Christmas Trees is one of my favorite places to show also. Love the green toile apron. i love the pictures of your cats. They are God's perfect animal. I am in love with the green toile. It would be perfect for my cottage kitchen. Wonderful giveaway! Love every little thing! Thanks for the chance to win! How awesome! I love the "kitchen" theme. I'd love to have a green toille apron....lol. What a beautiful set of kitchen items! Perfect for a new bride, or to keep. I adore the green toile apron. What a great giveaway. I LOVE that apron. It's hard to decide which one I like more but I love both the blue ones, I love anything floral pretty much! What a lovely parcel you've put together Donna! I love all the items you are offering. The aprons are so pretty. What a great giveaway someone is going to be very lucky!! Oh, I love the aprons! What a fun giveaway! I ♥ the light blue apron--although they are all simply gorgeous! Ooooh, love, love, love the toile. Great giveaway. This is a great giveaway. I'd love to be the recipient of your beautiful choices. Please enter me!! You have a thoughtful and generous giveaway package! Thank you so much for the chance to enter! Please be sure to visit my giveaway, too! I love your blog and I love your giveaway. the aprons are beautiful! Thank you! Nice giveaway! I hope I win I hope I win! Great giveaway. I hope I win! What a great giveaway, the measuring cups are so darling! Love all the goodies! I especially think the dark blue floral for the apron is beautiful! Thank you for the chance to win! Oh, fun! Those aprons are really cute. Wonderful giveaway. someone is going to be very happy...I really like the green toile. I think I do a lot more cooking in one of those cute aprons! My husband and I would both thank you!! Visit my blog and sign up for my giveaway if you like!!! I'm crossing my fingers! I love this giveaway......thanks for entering me. holy cow, awesome goodies you are giving away, I'm so in love with aprons right now, hope I win! Criss-cross my toes! Great creations. oh i love this giveaway!!!!! i want the green toile please!!! what a fun giveaway ! Oh my!! I'd love to win all those!! Thanks for the giveaway! If I won, I'd pick the green toile apron. I am building a new house and would love to create a cottage kitchen with these beautiful items! So sweet of you! Thanks for the chance to win! Blue is my favorite! Everything looks wonderful! What a beautiful gift collection! I can't believe it all came from CTS! That is awesome! Hi! What a WONDERFUL giveaway! Please enter me. Thanks for sharing such great goodies! What a sweet giveaway! I would be honored to have this basket filled with goodies! I love the green toile! Thank you so much for all your kindness and have a lovely week! What a lovely collection of goodies in your giveaway! How wonderful and generous of you. Please enter me in your giveaway draw...I would be so thrilled to win. i am having so much fun cking out all the wonderful giveaways. Love the oven mitt model! OH, I LOVE the green toil (I hope I spelled that right). I LOVE this giveaway. Thank you so much. I LOVE that quilted tote! I've never seen measuring spoons like that before...how lovely! And either blue apron would be lovely. And your Amanda is a clown...like my Tori! Another fabulous giveaway! Do enter me. I love the toile oven mitts! I really need a new pair. Thanks a lot for this great giveaway! 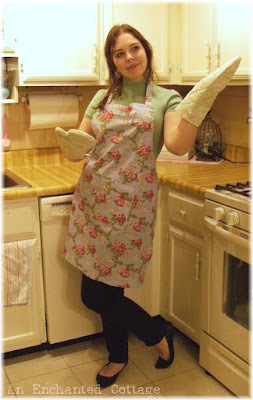 I love your blog and the aprons are so cute. I like the blue one. I love all three aprons!! Love your stuff! Wonderful giveaway.... Please add me, too! What a lovely giveaway! Please add my name. So much fun! Thanks for the cute kitchen-themed items you're giving away. I love the green toile apron! 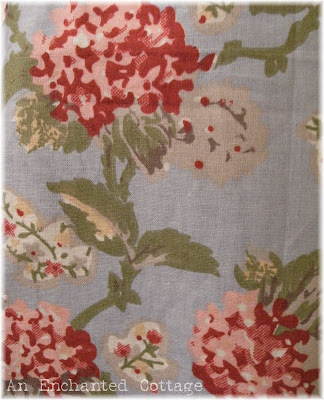 I have curtains in my kitchen made from the same fabric! Toile! Toile! Toile! I'm singing as I look at your post. What a great giveaway! I'd love to win that apron and the other kitchen things. Adorable! Ok, I HAVE to have those measuring spoons!! I've never seen anything like them. (sheltered, perhaps?) Great giveaway!! Please enter me in your lovely Giveaway. I love that green toile print! Ohhh, that green toile apron! So sophisticated and appealing! I love your taste in fabrics! Thanks for joining in the giveaway! Please enter my name in the hat! Thanks for posting such a sweet giveaway! love the apron! Measuring cups too- all so sweet! Oh what a marvelous assortment you have put together. I love kitchen goodies of all kinds. Coount me in please. I am in heaven over the aprons expecially the green toile. thanks for giving away such lovely things! Love the whole package! Both aprons are lovely and the goodies you have put together are wonderful kitchen items. Great decor for our home! Wonderful blog. I love your give away. Please enter my name. I love your blog, and this is a great giveaway!!! Oh my I am just drooling over all these things. Please enter my name. I believe this is my first visit to your blog, but I can't wait to visit more!! That green toile is just so gorgeous. Would so love to win this giveaway. Thank you for entering my name. Fabulous giveaway!!! Pick me, pick me! Love the kitchen theme giveaway. All three of the aprons are so adorable. Please nter me and I'll cross my fingers! How pretty, love the fabric choices! Ahh. This is an awesome giveaway. Oh If I win I want the green toile! I must have been without my computer when you posted this! I follow you so I should have seen it before now! please enter me in your give away. Love the kitchen theme items. What a wonderful giveway... please enter me. Have a wonderful day. You selected some beautiful things for this giveaway. Please count me in. What a great giveaway! Please enter my name in your drawing! Thanks! I usually frequent quilting blogs; this is my first time visiting lots of cottage blogs! I think your giveaway is a great one! Pls enter my name. Thanks! I really love the kitchen items you chose for your giveaway...so nice..
Great giveaways!! Please include me. Sensational give away! Please count me in. Thank you. Wow. How wonderful! I think I'd choose the green toile. Please enter me in your giveaway, and, if you haven't already, be sure to pop over to alovelything.com to enter mine. LOVEEEEEEEEE this giveaway.Seriously i'll cry if I win.enter me please ~!!! What a Beautiful set. Please enter me. Those are all beautiful and what a great way to 'package' it. Awesome giveaway! Love your blog! The green toile is so pretty! Thanks for the chance! Would LOVE to win any or all of these great items for the kitchen. Do you think they will help my cooking any??? I'm moving to a new home w/a new kitchen, in a new state...what perfect timing a win could be for me. 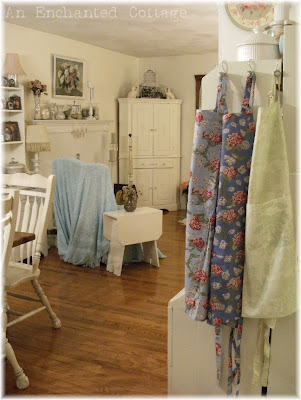 I love the green toile apron...it will match my new home perfectly! Thanks! I love this giveaway, please include me. Thank you so much. Beautiful giveaway- love the dark blue floral apron! Such pretty things! Please include me in the giveaway. Please count me in! Love that light blue formal apron! Thanks for the chance. I love the green apron! Very nice giveaway. and i need some new oven mitts sooo badly.